Happy New Year and Namaste! Such a momentous year 2015 was for the yoga community around the world and in our own backyard! 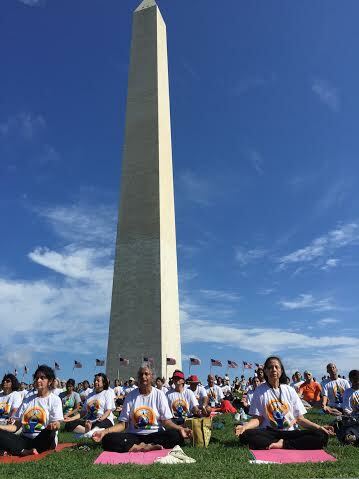 The first International Yoga Day celebrated in D.C. and around the world on June 21, 2015. The year 2015 will go down in history as the year when International Yoga Day (IYD) was officially launched. In addition to presenting exciting images from IYD as it was celebrated around the world, (see the YogaSetu website Home Page and Recent Events in Virginia/DC), this issue of the YogaSetu Newsletter (YSN – Vol. 4, No. 1, Jan. 2016) features an intimate interview with Jagat Guru Amrta Suryananda Maha Raja about his journey from the celebration of World Yoga Day (WYD) to the pinnacle of IYD recognition around the globe. 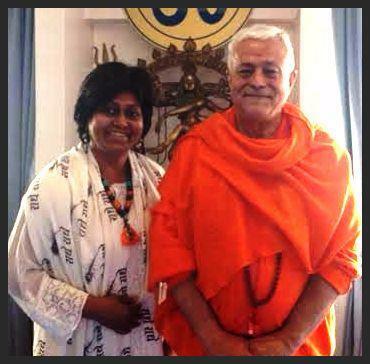 YSN Editor Abha Gupta with Jagat Guru Amrta Suryananda Maha Raja, President of the Portuguese Yoga Confederation at their headquarters in Lisbon, Portugal in June 2015. In this YSN issue, we are also honored to bring you some unique insights from Acharya Shunya, the President of the California Association of Ayurvedic Medicine. Her article, “The Five Great Elements: A Mirror to Our Being,” will help readers determine which dominant or combination of Nature’s Elements they possess, and understand their attributes as expressed in their own particular constitution, as we are ourselves an expression of Nature. You can also read news about China setting up its first yoga college and Cuba offering yoga to its people in our section on Global Yoga News. Yoga enthusiasts may also want to check out our listing of upcoming global yoga events scheduled for 2016, as well as notes about recent global events, particularly the video link to the Common Yoga Protocol film (36 mins.) and the booklet on general awareness about yoga issued by the Government of India, both in the section on Recent Yoga Events Worldwide section. Finally, we are proud to announce the availability of Dr. Dilip Sarkar’s exciting new DVD presentation on Yoga Therapy, developed for those looking for a new approach to healthy living, as well as for those who have some knowledge of yoga poses and seek further information on the philosophy, practice, and therapeutic aspects of yoga. Look below, for more information about this DVD and how to order. We invite you to delve into this issue, wishing you a very healthy and happy New Year!